"If you want to see the mountain you are standing on, you have to climb the far mountain.” The far mountains for me are the cultures and crafts of my northern ancestors who inspire my art today. In the land of the northern lights, midnight sun and reindeer, the indigenous Saami people live on and so do their crafts. Centuries ago, the Saami people developed a way of spinning metal thread and then began embroidering it on reindeer leather thus creating wearable art that celebrates their ingenuity and connection with the animals who have provided the Saami with sustenance and longevity. Studying this culture and their crafts I am once again reminded that there are many different ways to live and be. When I stand on my mountain, I look down and see myself rooted in the history and art of the far mountains. It is my hope my bracelets reflect that connection. Please enjoy wearing this art on your journey! The Saami are the indigenous people of Norway, Sweden, Finland, and the Kola peninsula of Russia. These people have lived in the area now commonly referred to as Sapmi (formerly Lapland) for thousands of years. Today there are between 70,000 and 100,000 Saami. Traditionally the Saami were a semi-nomadic people, with a culture evolving around reindeer herding, hunting and fishing. They also are known for their handcraft, Duodji. Fascinated with their work and specifically coiled pewter embroidery, I took a Saami bracelet class at North House Folk School, in Grand Marais, Minnesota. As a way of learning more about the Saami and about my own ancestors, the summer of 2014, I traveled with Vesterheim to Sapmi. 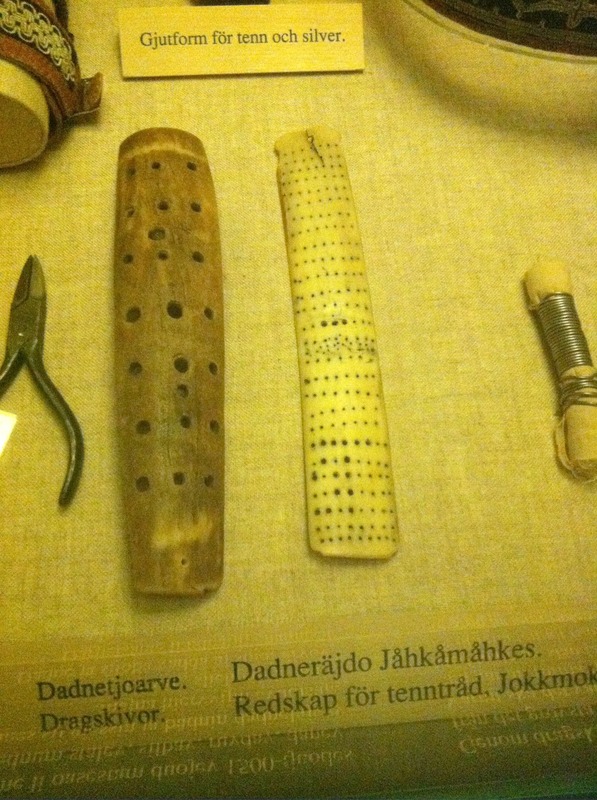 We spent several days in Saami museums in both Norway and Sweden. They had beautiful displays of the tools that were used in making the coiled pewter hundreds of years ago. These photos were taken in Sweden at the Ajtte Museum. Originally, pewter thread was made by splitting a birch twig, then removing the pith and binding the twig back together with a thread. The hollow twig was filled with a mix of tin and lead. The solidified pewter is removed from the twig and prepared by drawing it through holes of different sizes made in reindeer horns until the thread is as thin as desired. The pewter thread is then spun on a sinew thread. It is formed into braids or decorative patterns and then sewn onto fabric or leather. The pewter is now commercially made and I order my supplies from Sweden. I use both reindeer and lamb hide and my buttons are antlers. I continue to be inspired and hope you enjoy my work.